For my future projects, I plan to do a combination of Arduino and RPi development. The development of the Arduino code will be on my MS Windows PC and the RPi solution will be developed naively within the RPi Linux environment Given this distributed environment (and my ability to bungle things), I can foresee potential problems maintain good source code control. To deal with this, the combination of git and gethub seems the right way to proceed .... after all it has worked for the distributed Linux development community. The first thing I did was to set up git within my MS Windows PC. Given that I installed Cygwin when setting up the RPi, that is where I returned to install git. Therefore, I plan to use git within the Cygwin environment on my PC and not within MS Windows per say. This could be done, but my approach allows me to learn git commands once since, Cygwin is a Linux-like environment, everything should look and operate the same. To accomplish this I follow the instructions outline in Installing Git on Cygwin. These instructions are very straight forward. The challenge was in initializing git for my first project, at least it was a challenge for me since git is new tool for me and Cygwin didn't always cooperate. I had to address this the old fashion way .... read the documentation and trouble logs (vs. doing a web search for someones web post with instructions). All the important secrets of git can be found widely dispersed and buried deep withing these web sites: Git Documentation and Git Reference. Source information from trouble logs will be listed below. git config --global user.name "jeffskinnerbox"
To see what you got, use the git status command. This will tell you the files got staged but not committed. The commit will come later. First we need to set up our communal repository within github. You may be asking, What Exactly Is GitHub Anyway? Well, in a few words, github is a web-based hosting service for software development projects that use git. The next step is to go to github, set up your free login, and then set up a repository. In my case, I set up a github repository called Cygwin-Configuration-Files to store my configuration files established earlier under git control. It will be empty at this point, and that's all for now, loading it with files comes later. I didn't say much about how to set up github, but trust me, it is as simple as outlined above. It's via git that all the real work takes place. GitHub is all about giving you an off-site, web-access-able, complete version controlled historical record of your code that can be shared with others. If you get the above error, the problem is that Cygwin hasn't installed the ca-certificates package. 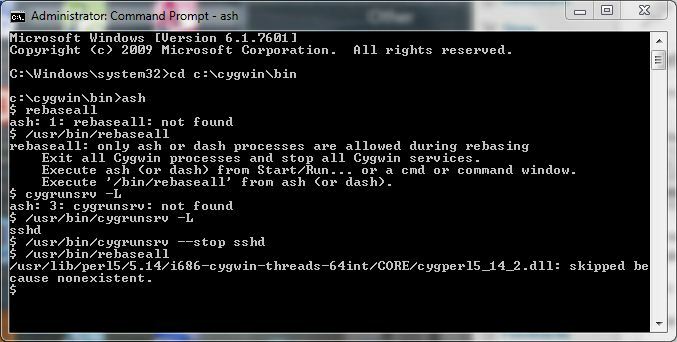 Run the Cygwin installer again, and add that package; after that git clone should start working. You will be put into vim to provide a comment that will be posted with the git version. Why vim? Because you executed the command git config --global core.editor vim earlier. If you don't want to use vim for adding comments under git, supply another editor when you do the configuration step. Admittedly, getting git setup under MS Windows / Cygwin isn't a walk in the park. It appears to work fine once set up, but the setup process can be painful. Git under the Raspberry Pi's Linux installs flawlessly, as you would expect, given git origins. First you install git via sudo apt-get install git. Then, just as was done above, do the initialization of the git environment, configure some parameters, add the files, setup the github, clone, and push. In my case, I setup a separate a github repository called RPI-Configuration-Files to store my RPi configuration files. I could have used the same repository as was setup for the PC environment but that didn't make sense for my present needs. So that's it! Its a long post for what is really a simple to use tool, but setting it up the first time could be a challenge. This Blog Powered By Pelican, TiddlyWiki, Python Notebook, Bootstrap, And Other Things. All my work on this blog is MIT Licensed, open, and free, except where indicated otherwise.